Please refer to our stock # 1603/4671 when inquiring. 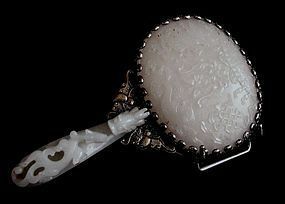 A Chinese very pale jade plaque and a belt hook mounted as a mirror. These high quality translucent 18 Century stones are superbly carved : the plaque with Buddhist symbols of the Canopy ( symbol of monarchs representing spiritual authority and shelter) , the Knot ( denoting longevity and eternity), the Vase (holding water of life and peace), the Lotus ( purity).The handle which originally had been a belt hook is beautifully carved with a chilong holding the lingzhi and confronting a dragon's head.This is an elegant and highly desirable item for a jade collector. Age: the jade carvings 18C., the mount later. size: 6 5/8inches (16.6cm) overall long. handle: 3 1/2 inches (9cm) . the panel: inches(7.5cm) x 3 3/4 inches (9cm). condition: very good indeed, the silver on the plated mount slightly worn. Chinese 19 C. jade plaque and belt hook mounted on a mirror Chinese jade 17C mounted on a mirror Chinese jade box with incised decoration 18C.